One of my real inspirations in life, Evan Tanner, passed away yesterday. He took a motorcycle trip into the California desert and ran out of gas. He didn't have enough water and was found dead. He was one of my absolute favorite UFC fighters ever and will always be in my heart. 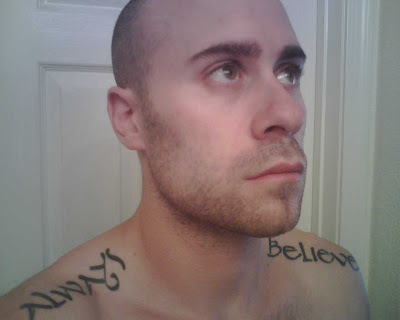 It was because of him that I was inspired to get my shoulders tattoo: "Always(rightside) Believe(leftside)"- pictured below. Evan will always be one of my inspirations as he lived his life as a silent warrior. He led by example and was as humble as they come. Evan I will Always Believe In The Power of One! Thank you for your amazing life.